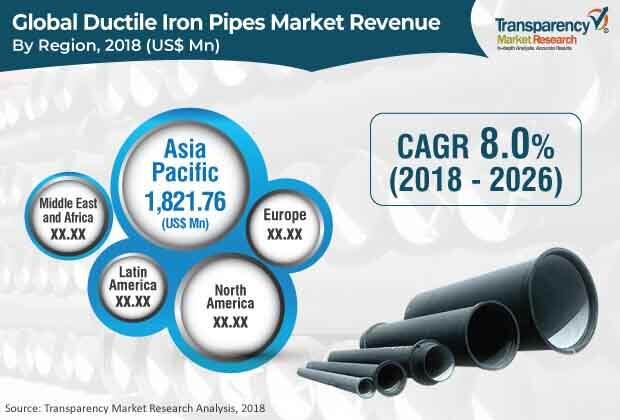 According to a new report ‘Ductile Iron Pipes – Global Industry Analysis, Size, Share, Growth, Trends, and Forecast, 2018–2026 published by Transparency Market Research (TMR), the global ductile iron pipes market was valued at around US$ 4,620 Mn in 2017 and is anticipated to expand at a CAGR of more than 8.0% from 2018 to 2026. Rise in demand for drinking water distribution pipes is driving the global market. In terms of value, the market in Asia Pacific is estimated to expand at a CAGR of more than 9.0% during the forecast period. Ductile iron pipes are designed to withstand severe operating conditions as well as environmental impacts. Increase in usage of ductile iron pipes in water distribution and irrigation is expected to propel the ductile iron pipes market during the forecast period. Ductile iron pipes are preferred over the traditional steel or plastic pipes. DN 700 - DN 1000 pipes are widely used to distribute drinking water from dams to urban areas. Inner coatings are essential for these pipes, as they are highly susceptible to corrosion. These pipes are also employed in mining applications and sewage water discharge pipes. DN 350 - DN 600 pipes are also largely used for drinking water supply and irrigation water supply. Ductile iron pipes are primarily used for drinking water distribution. These pipes are used to distribute water to industries, commercial buildings, residential buildings, and also for irrigation purposes. Ductile iron pipes are preferred for drinking water distribution due to their long life (more than 100 years), lower failure rates than steel and plastic pipes, and excellent corrosion resistance. Ductile iron pipes are reliable, durable, and cost-effective materials to transport potable water, industrial water, and household wastewater. Based on region, the global ductile iron pipes market has been divided into North America, Europe, Asia Pacific, Latin America, and Middle East & Africa. North America and Europe hold major share of the global ductile iron pipes market, as most pipelines in these regions are well established, but old. Therefore, these pipelines are being replaced in North America and Europe. North America constitutes significant share of the global market. Rise in use of ductile iron pipes by sanitary hygiene and water supply organizations in developing economies such as China, Japan, and India is projected to boost the market in Asia Pacific during the forecast period. The ductile iron pipes market in Middle East & Africa is estimated to expand at a rapid pace during the forecast period, led by the various drinking water supply schemes initiated by countries in the Middle East. The ductile iron pipes market in Latin America is expected to expand at a moderate pace in the near future. Key players operating in the global ductile iron pipes market are Saint-Gobain PAM, Jindal SAW Ltd, Tata Metaliks, U.S. Pipe, AMERICAN Cast Iron Pipe Company, Duktus (Wetzlar) GmbH & Co. KG, Electrosteel Steels Ltd., McWane, Inc., Kubota Corporation, and Xiamen Landee Industries Co., Ltd. Major players engage in acquisitions and joint ventures to enhance their market position.